This post is sponsored by Bonterra Organic Vineyards. The recipe is my original creation and all opinions and photos are my own. The holidays are upon us! Soon your home will be decorated and your kitchen full of all those great smells of the season. Thanksgiving happens to be my favorite meal to actually cook for others. I like to start things at 9am, and slowly get everything together as I sip on a glass of wine. One of the keys to making this holiday as stress free as possible is to prepare what you can ahead of time. I like to have one casserole done and the potatoes peeled and waiting in water the night before so I just pull it out of the fridge and get it heated up when the timing is right with the turkey. This appetizer is another one that you can make mostly ahead so that its an easy addition to your holiday meal line up. I've found that the better I plan the menu and am familiar with cooking times of all the various dishes, the more organized I am on Thanksgiving but most importantly the more fun I have cooking it all. And as much as tasty food is important, having fun with friends and family is the most important thing of all during the holidays! Personally, I don't think there are many things as fun as cooking with a good glass of wine. Bonterra has an amazing selection of even more amazing wine. Literally, I haven't tried one I didn't like and would be proud to serve any of them at my Thanksgiving table! Even the chardonnay was great and I don't typically care for chardonnay. This recipe is versatile in that it pairs well with a red or a white, so no matter what your preference is, it will taste great. Want to try Bonterra for your holiday table? Get 30% off your first order with code BLOG30. The only thing better than good wine is good wine and a deal! First, in a medium sized skillet, melt the butter over medium-high heat. Once melted, add the brown sugar. Allow the sugar to cook for several minutes so that it melts into the butter, stirring constantly. Once the mixture is fully combined, add the pecans and pumpkin spice seasoning. Stir to coat the pecans in the butter-sugar-spice seasoning evenly. Pour mixture onto wax paper to cool, leveling it out to a single layer. Set aside. Preheat the oven to 420 degrees. Slice the sweet potatoes in about 1/8 to 1/4 inch slices. They should be thick enough to hold the topping, but not too thick to dominate the flavor. Pour the olive oil on a large sheet pan, and arrange the sweet potato slices in a single layer, so that every slice is touching the pan. Bake for about 17-20 mins, or until the side facing the pan is golden brown and the top side is soft but not mushy. Remove from pan and allow them to cool on paper towels or a cooling rack. Sprinkle with sea salt. Allow the sweet potato crostini to cool COMPLETELY before applying a thick layer of goat cheese to each crostini. Break up the cooled candied pecan topping and sprinkle on each piece of sweet potato. If you prefer a sweeter appetizer, use more of the nuts per piece; if you'd prefer a more tart appetizer, use fewer nuts. Garnish with chopped chives, and serve at room temperature. I hope you enjoy this easy Thanksgiving appetizer! Bake the sweet potatoes the night before to make it easier and to ensure they're cool enough for the goat cheese the day of Thanksgiving. Pre-making parts of dishes also means there's more time to spend with friends and family, and more time to enjoy some amazing Bonterra wine with your holiday meal. Oh my goodness. YUM YUM YUM!!! This is the perfect Thanksgiving appetizer. I might do this for our holidays this year! Yum!!! I love a good app and yes to cooking with a nice glass of wine. I will definitely have to try this on Thanksgiving this year. This sounds and looks so very delicious! I just love sweet potatoes and will be making these at my Friendsgiving dinner! These look so cute and delish! 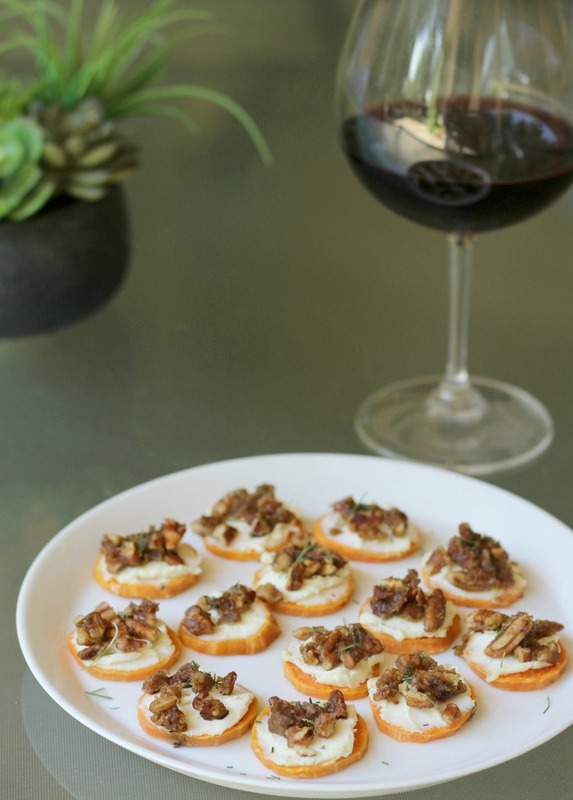 Such a great appetizer for the holidays! I'm dying over that crostini - looks so good!! I absolutely looooove sweet potatoes (I had a sweet potato post today, too)! These are adorable, and what a fabulous ideas! OMG goat cheese, sweet potatoes, and pecans?! All three of my favorites in one dish! I cannot wait to make this app during Thanksgiving! This appetizer sounds just up my alley! I will be adding this to my Thanksgiving menu. It's cool that you report such things.